Explore the beautiful islands of the Tuscan Archipelago with a Sailing Tuscany bareboat or skippered charter. From the base in Punta Ala Marina, Elba can be easily reached in a few hours and is perfect for a weekend sail, visiting many picturesque ports and coves. The other islands, all very unique, are with easy sailing distances. Even Corsica and Sardinia, with their pristine beaches and emeralds seas, can be reached in a week long sail. 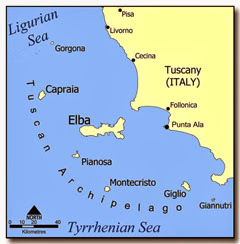 According to legend, the islands of the Tuscan Archipelago – Elba, Capraia, Gorgona, Montecristo, Giglio, Pianosa, Giannutri – were created when Venus of the Tyrrhenian Sea emerged to embrace the sunset. As she did, her necklace broke and six pearls fell into the sea creating each of the unique islands. Bareboat and skippered charters, unlike flotilla holidays, give you the complete freedom to choose your route and destination. Visit an island, explore a cove, anchor for lunch or to swim. There is no set itinerary, the seas are warm, the winds gentle, just enjoy. Cant’t sail or out of practise? No problem, a skipper with local knowledge can be provided to sail the yacht for you. What’s more, you’ll have an on-board guide so you can relax enjoying the same sun, sea and beautiful locations. For some ideas what can be done in a weekend, one week or two week trip, see our Suggested Routes page on the side menu.